Seagrass Polzeath, is a recently completed five-bedroom house overlooking Daymer Bay and Polzeath Beach in this popular north Cornwall village. Our clients purchased this greenfield site and wished to develop a new family home that was informed by its coastal surroundings and took full advantage of this unique location on the edge of a development boundary. This extraordinary property features accommodation over three levels including a gym and cinema room with several defined living areas and spectacular views from the first floor bedrooms and balconies. Never having hired an architect before, we had to trust to instinct rather than experience in appointing advisers for the construction. We interviewed several, and were attracted to Bazeley's highly-professional approach and absence of arrogance. The latter made for a positive working dialogue as they actively sought our design preferences and adopted a can-do approach throughout. The latter was particularly important in emboldening us to make a major alteration to the balcony structure during the construction phase. We needed a project manager with a strong technical orientation as well as a designer, and Martin Back and Rob Grieve provided authority and communicated well with us throughout the process. 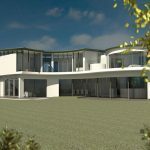 As a greenfield construction, we agreed that the property needed to sit well in its coastal surroundings and their vision was vital in achieving that goal. We would recommend them without hesitation.